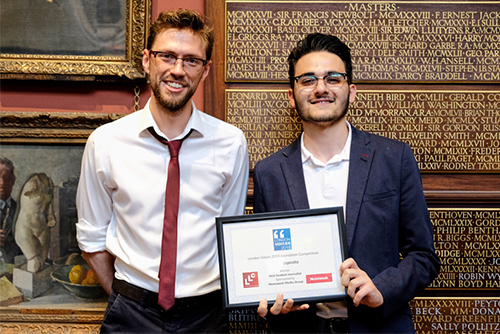 Journalism students from City, University of London have collected four awards at the London Voices 2018 competition. The competition, which has been running for two years, promotes emerging journalism talent across the capital. It is open to anyone over the age of 14 who lives, works or studies in London. Both Luke and Thomas are studying at City and have just started working together. 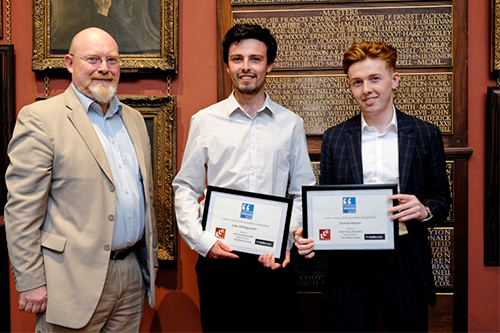 Luke’s passion for journalism began when he started producing his own motor sports magazine from home at the age of 10, and Thomas worked for his school magazine in Lancaster and runs his own blog. Luke and Thomas made their video after becoming aware that an impending vote on changes to licensing hours in Shoreditch, which would affect all local bars and clubs, was not being covered by local press or highlighted to local businesses. Thomas did the role of on-screen presenter with Luke behind the camera, and both worked together on the script and editing. Both Luke and Thomas still have a year to go at university, but Luke has always dreamed of being a Formula 1 presenter while Thomas hopes one day to be seen on-screen presenting the news or as a foreign affairs correspondent. 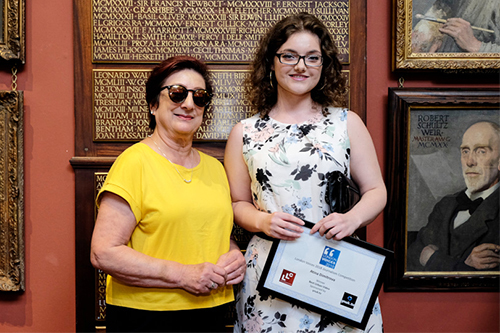 Atina came to London in 2015 from Bulgaria to study journalism at City. She is interested in making documentaries about international relations, war, peace and human rights. She helps edit the hyperlocal website St John Street News and has interned at the Hackney and Islington Gazette. Her video covers the implications of a lack of digitally-skilled talent in London and the effect this may have on the future economics and development of London and the UK. Atina hopes to study further and get experience as a political correspondent on a national newspaper or as a video editor at a TV channel. Valerio is from Italy and moved to London in 2015 to study for a BA in Journalism at City. He is editor of the St John’s Street News hyperlocal website reporting on local community issues around Islington and Hackney. He made his video after hearing about Sadiq Khan’s plan to install more ‘changing places toilets’ in London and wanted to find out what impact the lack of current facilities has on the quality of life and dignity of disabled people and their families. Valerio has just got a job as a script assistant at Sky News and wants to work in broadcast journalism. 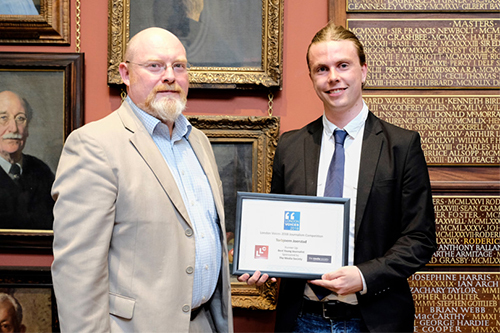 Torbjoern’s passion for journalism started during a school exchange with the USA where he worked as a student reporter. Originally from Norway, he still spends his summers working for a regional newspaper near Oslo. His written article deals with the destruction wrought at Highbury Corner by a doodlebug bomb, creating so much damage that the area was later cleared to make place for a roundabout. Torbjoern dreams of a reporting job covering current affairs with a national newspaper or producing features, especially covering culture, arts or history.